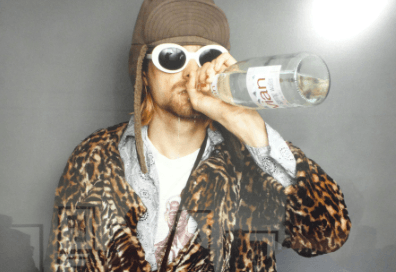 The exhibition now at the Brooklyn Museum through May 12, illustrates the dichotomy of the famous “uni-browed” artist. “There was a difference in how she considered herself internally and how she presented herself to the world,” said Lisa Small, Senior Curator of European Art during a private tour sponsored by Sotheby’s Preferred. 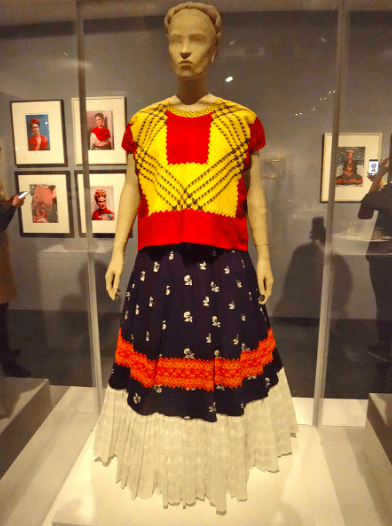 The exhibition is a hybrid of the 2012 Frida Kahlo Museum in Mexico City and the Victoria and Albert Museum’s 2018 “Making Herself Up” which has been “Brooklynized,” according to Small. 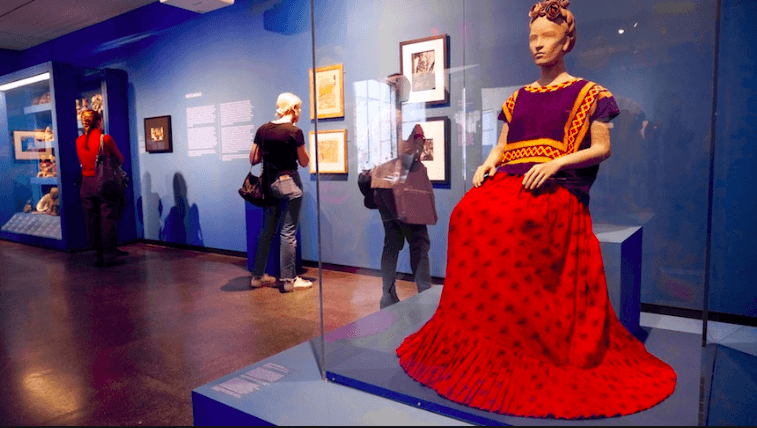 Garments, photographs, jewelry, personal items such as cosmetics, and paintings of Frida’s were stored upon her death in 1954 by Kahlo’s husband, renowned artist Diego Rivera, at their home “Casa Azul” with instructions that they could not be shown until 15 years after his death which occurred in 1957. These items became further enshrouded in secrecy as the executor of the estate Dolores Olmedo (one of Diego’s rumored dalliances) kept everything locked up until her death in 2002. 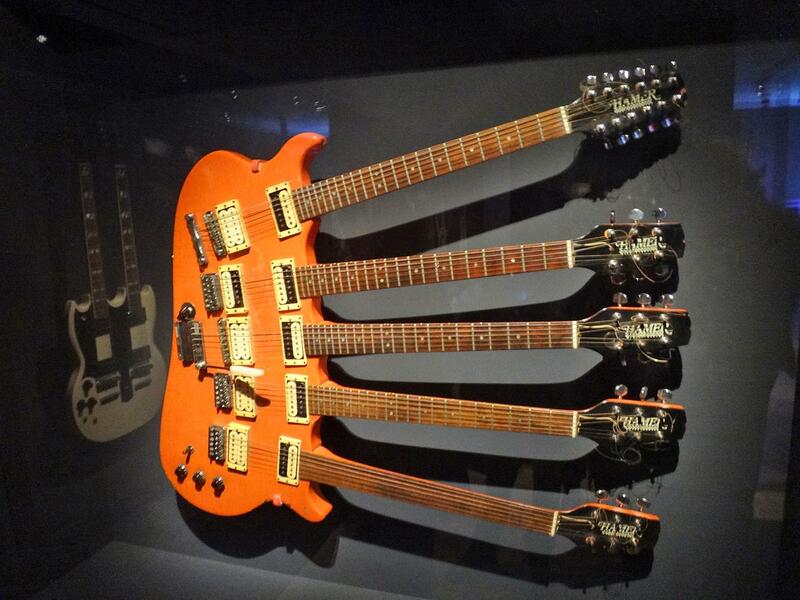 Finally, nearly a half-century later the doors and closets hiding these treasures were unlocked, and everything was cataloged and inventoried at the Casa Azul Museum before going on the road to London and now for the first time in the U.S. 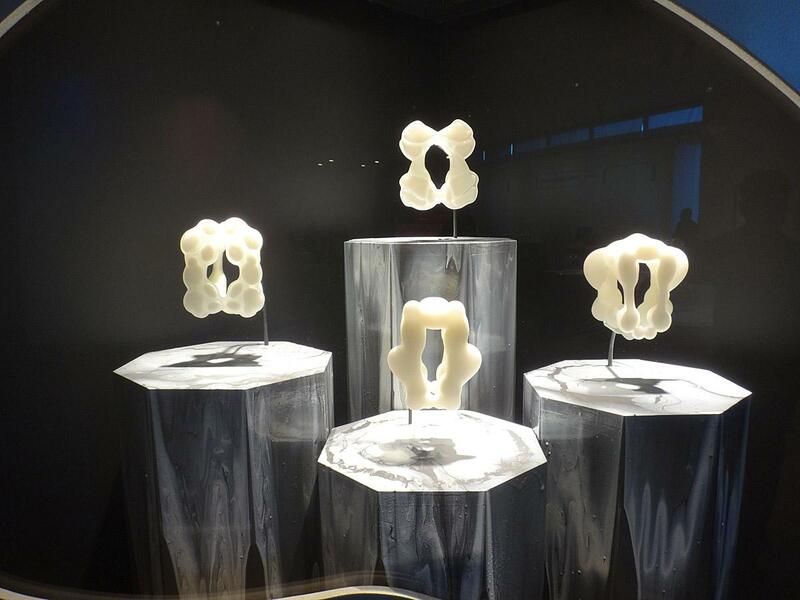 The exhibition is arranged thematically rather than chronologically, which I don’t ordinarily like; however, in this case, it makes sense and is relatively easy to follow. 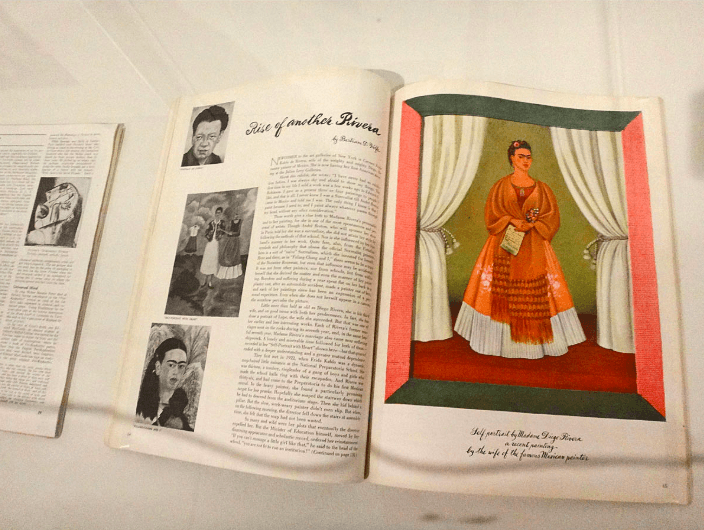 Beginning with a section called “Roots,” Kahlo’s close relationship with her German photographer father Guillermo is illustrated with the many photos he took of her. She was influenced by his career to learn everything about photography including the technical side of it. She also learned to pose in front of the camera – “the gaze she returns is the same as in her later self-portraits,” said Small. That constant, steady gaze is also seen in the popular color-saturated photos taken by her lover Nickolas Muray, of which there are many striking examples. 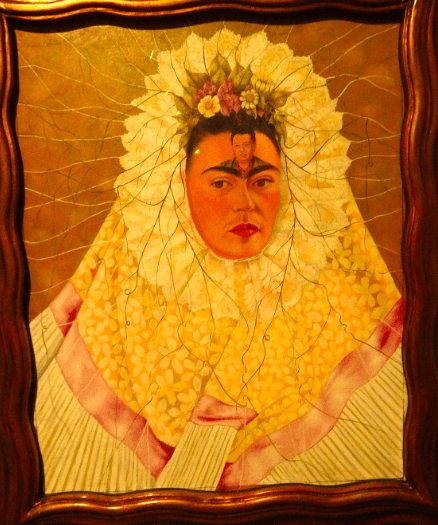 Almost from the beginning, Kahlo was cursed with ill health. When she was six she developed polio leaving one leg shorter and thinner; at 18 she was involved in a near-fatal traffic accident in which her spine was broken in several places, and a metal rod went through her pelvis. The rest of her life she was basically “living while dying,” resulting in many surgeries, long periods of prescribed bed rest (which she didn’t always follow), dozens of prosthetic devices and near constant pain. 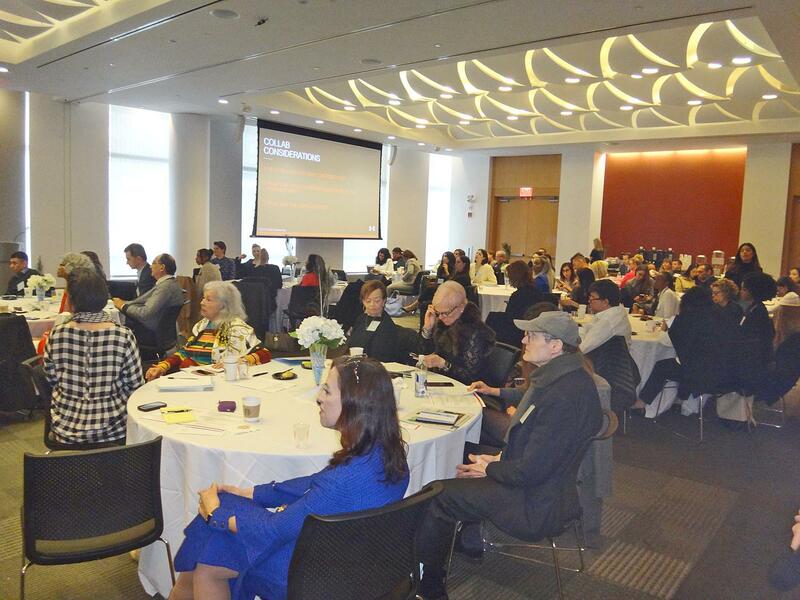 Another interesting dichotomy centers on Kahlo’s religious beliefs. Although her racially mixed Indigenous and Spanish mother was a devout Catholic, Frida rejected Catholicism while using the Catholic visual iconography in votive paintings (known as Ex Votos). She embraced Communism as can be seen in the “Art & Revolution” section where she proclaims “I am a Communist being,” even attempting to change her birthday from 1907 to 1910 to symbolize the beginning of the Mexican Revolution. Rivera and Kahlo’s shared love of Communism was one of the major forces keeping them together – though they both strayed from the marriage with other partners – divorcing in 1939 yet remarrying in 1940. Despite the mutual dalliances, they were “the most important person in each other’s life,” according to Small. 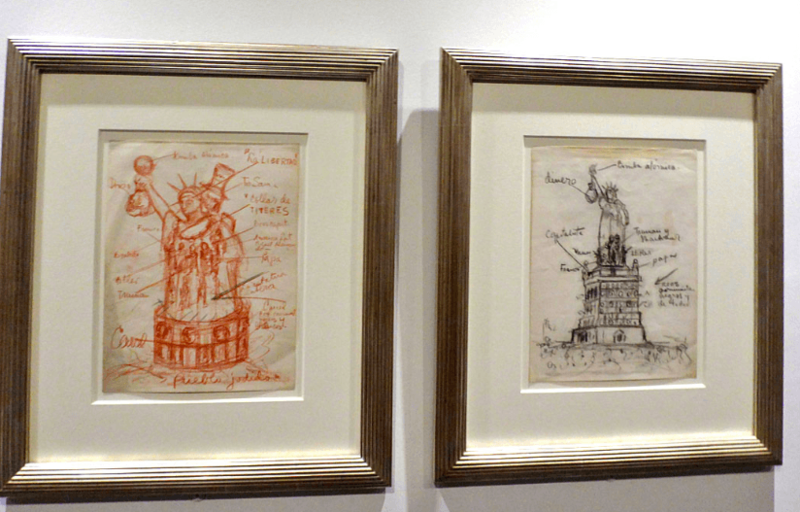 As for New York, Kahlo’s sketches of the Statue of Liberty show the icon holding a bag of money rather than a torch – parallel symbolism perhaps to Rivera’s commissioned mural work of Rockefeller Center in which he inserted images of Lenin, which he would not remove, ultimately getting him fired. Although the couple supported Workers of the World for worker’s rights and other Communist organizations they were living nicely, commanding a good income despite the Great Depression of the ‘30s. When Trotsky was exiled to Mexico, he and his wife came to stay for two years at the Casa Azul while Rivera and Kahlo moved into an adjoining building on the estate. 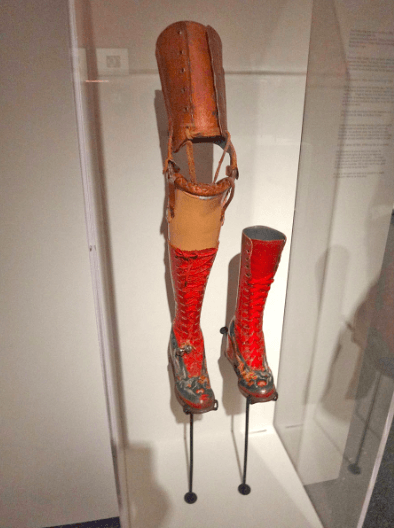 The “Disability and Creativity” section displays Kahlo’s lifetime battle with her health. Initially wanting to study to be a doctor she realized she wasn’t going to be able to be able to do that and turned to art, even painting self-portraits while on her back with a mirror while confined to her bed. After suffering a miscarriage after a failed abortion in 1932 (apparently, she was very conflicted about whether to have children) her art became more personal. 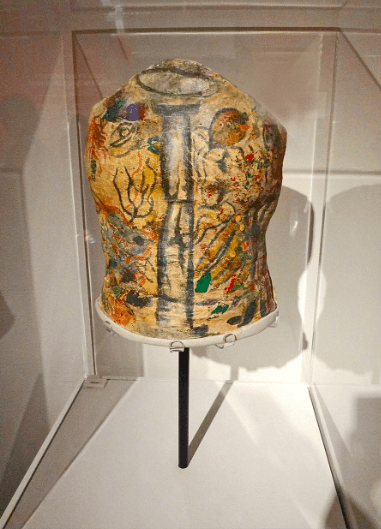 She painted a broken column on her plaster corset symbolizing her broken spine and a child in her womb. In the year before her death, she wore a prosthetic leg which she painted and placed a bell on following a to-the-knee amputation due to gangrene. All of these orthopedic support devices of leather, steel, and plaster, as well as her body deformities, could be better camouflaged with the looser boxy clothing and long skirts that she favored. 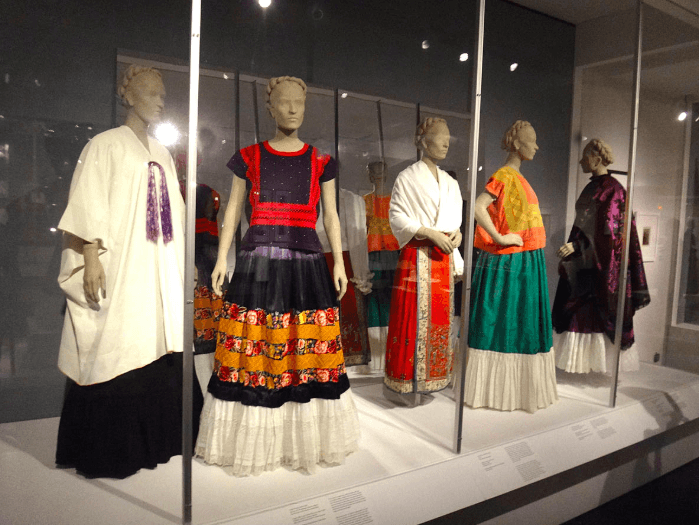 The last room of the exhibition is definitely the most dramatic with several cases of her dresses and rebozos (shawls) on display. Another example of how she liked the “finer things in life” is shown here with a Chinese embroidered silk textile used on a skirt that she bought in San Francisco. She would often have a long flounce of lace or muslin added to the hem of her skirts to cover her leg. The title “Appearances Can Be Deceiving” is a loose English translation of what is written in Spanish in Kahlo’s handwriting on the bottom of an undated charcoal and colored pencil on paper sketch. 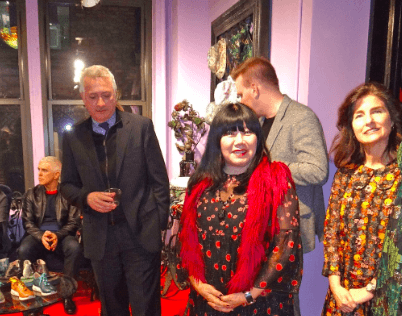 Here the artist gives us a sad glimpse of what is hidden underneath her outward festive presentation — exposing the painted plaster corset and butterfly covered shrunken leg shrouding her broken body.